If you have been taking care of your own lawn and weed control has gotten out of hand, there are plenty of things you can do to eradicate your weeds. You can certainly crawl around your yard and yank those suckers out by hand, but you definitely don’t have to. You don’t even have to lug around a spray can of weed killer – there are easier ways to handle lawn and weed control. Even people without a green thumb can follow the basic steps necessary to eliminate and prevent weeds in a yard. To get rid of the weeds that are already established in your yard, you need to apply a broad leaf weed control product. Certain products have special formulas. Apply the right formula on the entire law. As long as you follow the manufacturer’s specifications, the products will kill weeds, but not grass. Using a concentration that is even a little too strong can damage and even kill your grass. After the weeds are under control, it’s time to prevent future weeds from cropping up. This is where pre-emergent weed control comes in handy. Pre-emergent products prevent weed seeds in the soil from growing past the germination phase. Following pre-emergent weed control directions to the letter is also extremely important. When applied incorrectly, they can also burn or even kill the grass you are trying to protect. Another important thing to keep in mind about lawn and weed control is that a thick, healthy lawn will do an excellent job of choking out weeds. Grass blades that grow tightly and vigorously will not leave enough light, water, or nutrients for weeds to successfully grow. Therefore, following a good schedule of fertilizing, trimming, and watering could be the most effective weed control method there is! On the other hand, if you had a good handle on appropriate fertilizing, trimming, and watering of your grass, you won’t have a weed problem to begin with. Keeping up with a busy lawn care schedule can be difficult for working families. But in order to have the lush, green lawn you really want for your family, it’s important to put in the effort it takes to achieve this goal. The good news is that Kemko Lawn & Shrub is here to help. Our experts can assess your lawn and recommend a care plan. This plan will get your yard whipped back into shape in no time. And when you sign up for weekly service calls from Kemko, you can rest assured that your lawn will always look its best. 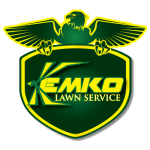 Click this link to request a free estimate for lawn and weed control for your home from our expert team at Kemko Lawn & Shrub.